EPI’s David Cooper delivered the following testimony before the Massachusetts Joint Committee on Labor and Workforce Development in support of S.1004 and H.2365 on September 19, 2017. Chairmen Lewis and Brodeur, Vice Chairwomen Jehlen and Farley-Bouvier, members of the committee, thank you for allowing me to testify. My name is David Cooper. I am the senior economic analyst at the Economic Policy Institute (EPI) in Washington, D.C – a nonpartisan, nonprofit research organization whose mission is to analyze the economy through the lens of the typical U.S. working family. EPI researches, develops, and advocates for public policy that ensures the economy works for all Americans, with a focus on policies to support low- and middle-income households. I am testifying in support of S.1004 and H.2365, which would raise the Massachusetts minimum wage to $15 per hour by 2021. In my testimony, I will discuss why $15 in 2021 would be an appropriate level for the minimum wage, and briefly summarize what the economics literature tells us about how an increase to such level is likely to affect businesses and job growth in the state. I will discuss why claims that a $15 minimum wage will damage the state’s labor market are unfounded and obscure the more important question of how a $15 minimum wage will affect the welfare of the state’s low-wage workforce. Finally, I will discuss the findings of a recent study on Seattle’s minimum wage, and why lawmakers should ignore that study’s results. As shown in Figure A, since the late 1940s until the late 1960s, the federal minimum wage was raised regularly, at a pace that roughly matched growth in average U.S. labor productivity. The federal minimum wage reached an inflation-adjusted peak value in 1968 of $9.90 per hour in 2017 dollars. Since then, increases in the federal minimum wage have been either too infrequent or inadequate to simply keep up with inflation, resulting in a federal minimum wage that is worth 25 percent less today than it was nearly 50 years ago. Increased inequality – specifically, greater distance between low-wage workers and workers in the middle class. Although many states have enacted minimum wages higher than the federal minimum wage, the vast majority are still at levels below the 1968 value and virtually all are still inadequate to ensure that someone working full-time, year-round can afford a decent quality of life. For example, someone working full time, year round at the current Massachusetts minimum wage of $11 per hour earns pre-tax income of roughly $22,900. According to the Economic Policy Institute’s Family Budget Calculator—which calculates the income required for a typical family or individual to afford modest yet adequate living standards with no savings left over—it currently would cost a single individual with no children in the Pittsfield metro area (the least expensive region of the state) $28,536 annually. This equates to a full-time, year-round wage of $13.72 per hour in 2017. Using the CBO’s projections for inflation, the hourly wage required to meet the family budget standard in 2021 will be $15.05. By 2022, it will be $15.41. Thus, $15 per hour in the early 2020s is a reasonable target for a wage floor that affords a decent quality of life, at least for a single childless worker in the lower cost areas of Massachusetts. Of course, many workers and families—especially those in more expensive parts of the state—will inevitably still require additional support through state and federal assistance programs. Notes: Historical inflation adjustments use the CPI-U-RS. All projections for 2017 onward use CBO's June 2017 projections for inflation under the CPI. *Describes federal minimum wage increase from $5.15 to $7.25 that occurred from 2007-2009. **Changes describe Massachusetts state minimum wage increase from 2015-2017. 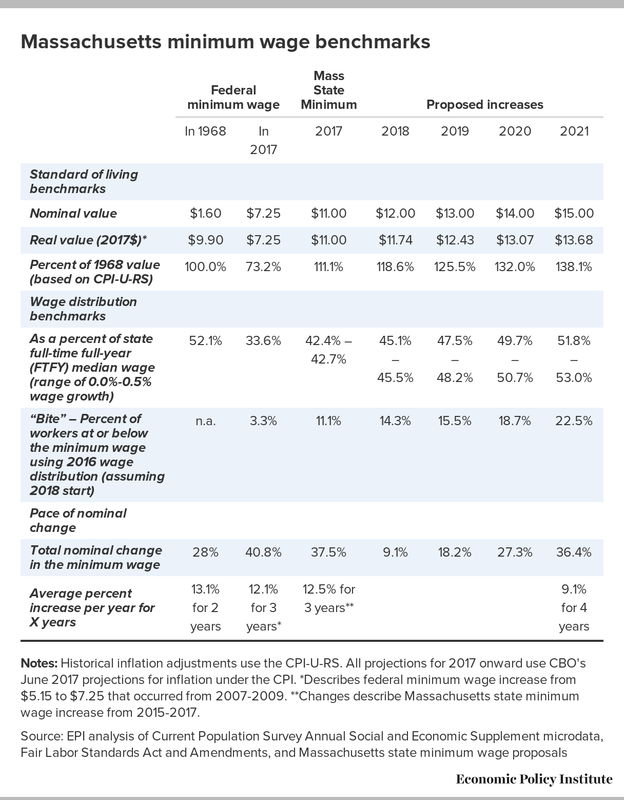 Raising the Massachusetts minimum wage to $15 by 2021 would raise the purchasing power of the minimum wage to a new high point, but would be a return to previous levels by other key measures. Using the Congressional Budget Office’s projections for inflation, $15 in 2021 is the equivalent of $13.68 in 2017 dollars – an increase of 38.1 percent over the 1968 purchasing power of the federal minimum wage. 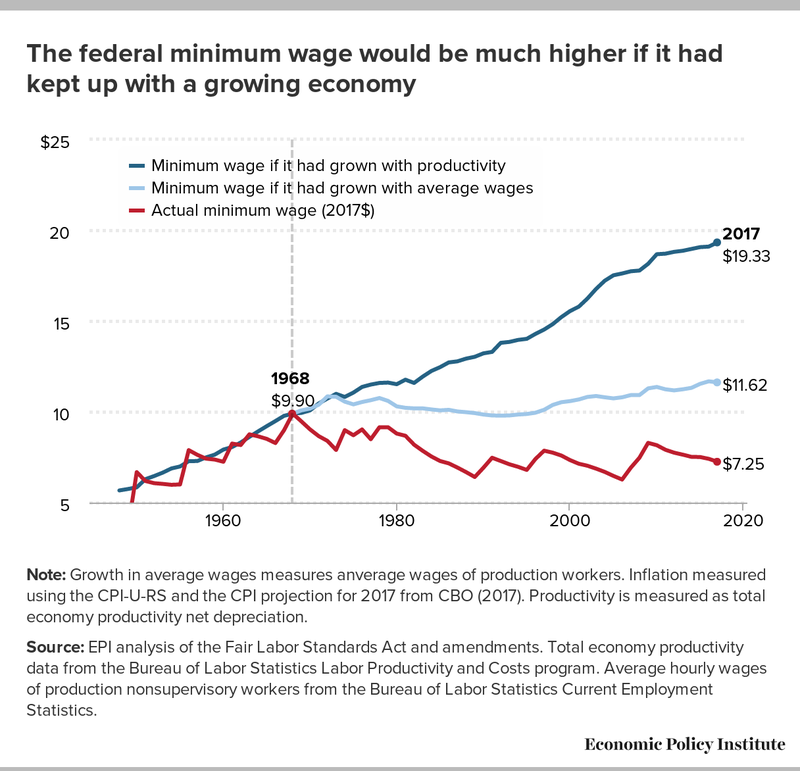 However, $15 in 2021 would be essentially the same level of the minimum wage relative to the overall wage distribution as the 1968 federal minimum wage. Economists often assess the strength of the minimum wage by calculating the ratio of the minimum wage to the median wage of a full-time worker (i.e., someone in the exact middle of the wage distribution.) As shown in Table 1, at its historical high point in 1968, the federal minimum wage was equal to between 52 of the national median wage. In Massachusetts today, the state minimum wage of $11 is equal to 42 percent of the state median wage. Under conservative assumptions for median wage growth over the next 5 years, a $15 minimum wage in 2021 would equal between 51 and 53 percent of the state median wage – virtually identical to the national ratio in 1968. A $15 minimum wage in 2021 would effectively undo the growth in wage inequality between low- and middle-wage workers that has occurred over the past 50 years for workers in Massachusetts. The United States has had minimum wages of this same relative level before, with no obvious damage to the health of the labor market. Unemployment in 1968 was below 4 percent, and modestly declined over the two years following the increase to the minimum wage’s highest point. Given that productivity has increased significantly since that time, it should be an even easier lift for the economy today to accommodate a minimum wage at this level. Various states and counties have had minimum wages of at these same relative levels at times over the past several decades. During this time, there has been extensive research on the effects of higher minimum wages on employment, the bulk of which has concluded that higher minimum wages have had negligible effects on job growth.1 A Massachusetts minimum wage of $15 in 2021 would fall within the bounds of this research literature, suggesting that a minimum wage of this level would not produce employment effects different from what has been observed in the literature. Modest price increases, on the scale of 0.3–1.5 percent per 10 percent increase in the minimum wage. These increases can be more easily absorbed as result of concurrent boost in pay to a large portion of the region’s workforce, combined with the fact that all area businesses will be facing similar increases in labor costs – i.e., no single business will be at a competitive disadvantage if they all must raise prices. Indeed, recent job growth in Massachusetts has shown little to suggest that recent minimum wage hikes have been overly burdensome. Over the two and a half years since the state began raising its minimum wage from $8 per hour to the current $11 per hour, job growth in Massachusetts has outpaced that of every other state in the region, save for New Hampshire, where job growth has been essentially that same as in Massachusetts. Although such trends should not be interpreted as evidence that raising the minimum wage has had no impact on the state’s labor market, they do dispel claims that any minimum wage increase will substantially damage the state’s job growth, or put Massachusetts at a significant disadvantage to its neighbors. As previously noted, a Massachusetts minimum wage of $15 in 2021 would be higher than the 1968 high point of the minimum wage in terms of purchasing power, yet within the bounds of past experience when comparing the position of the minimum wage to the wages of a typical worker. Similarly, the pace of the proposed change – increases of less than 10 percent per year – is consistent with the increases that have been studied. This suggests that by at least this two metrics, an increase to $15 by 2021 is likely to produce effects no different than what has been observed by existing research. Whereas the benefits of higher minimum wages in terms of increased earnings for low-wage workers and their families have always been relatively clear, assessments of potential costs are more uncertain, particularly given the nature of the low-wage labor market. A distinguishing feature of the low-wage labor market is a high degree of churn—i.e., workers moving into and out of employment. Low-wage workers’ labor market experience is typically characterized by spells of employment and non-employment throughout the year. (Nonemployment spells may be the result of a variety of factors, not limited to the availability of jobs. For example, caring for children and family members, or attending school can also limit availability for work.) For many low-wage workers the number of hours they work each week can also varies, sometimes at one job and sometimes across multiple jobs. In forthcoming research, my colleagues at the Economic Policy Institute and I show that in any three-month period, 1 out of every 5 low-wage workers experiences a transition into or out of employment. A recent study from the University of Washington argues that Seattle’s minimum wage increases led to large employment losses.3 In contrast to the average study published by scholars over the last 25 years4, this study found that the city’s minimum wage increase led to reductions in both jobs and hours for low-wage workers that were large enough to result in a net reduction in their quarterly earnings. Considering its unique findings, some observers have described the Seattle study as a cautionary tale that demonstrates the danger of significantly higher minimum wages, only now revealed because of the authors’ access to a novel data source. However, these claims are without merit. The Seattle study does not, in fact, examine significantly higher minimum wages than what has been studied under previous research. More importantly, the study suffers from several glaring data and methodological problems that bias its results to find negative job impacts even when none may have occurred. As explained in detailed analyses by Zipperer and Schmitt (2017), and Rothstein and Schanzenbach (2017), the study’s problems are so severe that it cannot provide any credible guidance for policymakers considering higher minimum wages. I will briefly summarize these critiques. First, it is important to recognize that the University of Washington’s study examined only the first and second steps in Seattle minimum wage increase, when the city’s minimum wage for large employers rose from $9.47 to $11 in April 2015 and from $11 to $13 in January 2016. (The Seattle minimum wage law has a slower increase schedule for small businesses and for workers that receive tips – meaning that the $13 minimum wage in January 2016 did not apply to all workers in the city.) Because Seattle is a high-wage city, a $13 minimum wage—although high in absolute terms—is not unprecedented in the context of Seattle’s overall wage distribution. Seattle’s $13 minimum wage in 2016 was equal to roughly 50 percent of the area’s median wage – a value within the bounds of past research.5Nevertheless, the study’s findings are a huge outlier in the minimum wage research, showing estimated negative employment effects that are ten times larger than the norm of past research. Such extreme outlying results despite being within the range of past research should raise immediate questions about the study’s data and methods. Second, the study omits a crucial portion of the workforce from its analysis. The data source used by the authors does not allow them to identify whether individual employees working for businesses with multiple locations work inside or outside of Seattle city limits. Consequently, the authors exclude most multi-site employers from their analysis – an omission that accounts for nearly 40 percent of all state employment, and likely excludes many employees at the very chain stores, restaurants, and coffee shops that are most affected by changes in the minimum wage. The most glaring problem, however, is that study implausibly finds large employment effects caused by the minimum wage increase in parts of the labor market where there should be little effect. While the study claims to show a large reduction in the number of jobs paying less than $19 per hour, it also implies that the increase in the city’s minimum wage to led to large increase in the number of jobs paying more than $19 per hour – well above the range where changes in the minimum wage should have substantial effects. Similarly, the authors find large reductions in hours worked by low-wage workers, yet substantial increases in hours worked by higher-wage workers – again, ostensibly caused by the increase in the minimum wage. The most likely explanation for these odd results are that the study’s methodology fails to accurately account for Seattle’s booming labor market during the period being studied. Since Seattle began raising its minimum wage in 2014, the city has enjoyed exceptional job growth. In any tight labor market where jobs are being added rapidly and unemployment is low, employers are under pressure to raise wages to attract and retain staff – resulting in a shift from more low-wage jobs to higher-wage jobs. It appears that the University of Washington’s study incorrectly interprets this shift as a negative consequence of the city’s higher minimum wage when it is, in fact, the normal positive effect of a very strong labor market.6 Because it fails to distinguish between the consequences of the minimum wage increase and other independent labor market trends, the University of Washington study adds nothing to our understanding of how minimum wages affect the labor market. Given improvements in productivity, low-wage workers in Massachusetts and throughout the United States could be earning significantly higher wages today had lawmakers made different choices over the past 50 years. Raising the Massachusetts minimum wage to $15 an hour by 2021 would finally raise the state’s wage floor to a purchasing power above the previous high point set in the late 1960s. It would simultaneously return the wage floor to about the same position it had at that time relative to the wage distribution in Massachusetts. The bulk of the research on the effects of higher minimum wages has found that past increases have achieved their intended effects, raising pay for low-wage workers with little to no negative impact on employment. This research should encourage lawmakers to pursue higher minimum wage levels, both because past increases were effectively costless. Moreover, the benefits in terms of larger total pay for low-wage workers are likely to vastly exceed any potential costs in terms of reduced job growth. In the high-churn low-wage labor market, even if a wage hike did reduce growth in low-wage jobs, it still may not adversely affect the welfare of most low-wage workers. What matters is the resulting effect on workers’ total annual work hours and net earnings. The recent Seattle minimum wage study, which claimed to show a negative outcome on these measures is methodologically flawed and should be ignored. 1. For a review of this literature, see Belman and Wolfson (2014) or Kuehn (2014). 4. See Belman and Wolfson (2014). 5. Zipperer and Schmitt (2017). 6. See Dube (2017) for further explanation. Jardim, Ekaterina, Mark C. Long, Robert Plotnick, Emma van Inwegen, Jacob Vigdor, and Hilary Wething. 2017. “Minimum Wage Increases, Wages, and Low-Wage Employment: Evidence from Seattle.” National Bureau of Economic Research Working Paper no. 23532.